The Swiss crocodile is perhaps one of the most beautiful and exotic-looking locomotives of the time. Its articulated design makes it an engineering marvel. Seeing it traverse the mountainous regions of Switzerland must have been an incredible sight! Without question, the scale models produced by Marklin of this Swiss legend for almost a century paid close attention to detail and design. Collectors around the world cherish Marklin crocodiles for their incredible design and aesthetic appearance. Whether in green, brown, or white livery, each locomotive is an absolute treasure to behold! Don’t yet have a Swiss beauty in your Marklin collection? There are always many rare Swiss Marklin locos available for sale on eBay at any given time. Click here to view a filtered query for Swiss locos on eBay. The SBB (Swiss Federal Railways) first ordered a prototype locomotive, named SBB-CFF-FFS Ce 6/8 I number 14201, in early June 1917. These first production “Krokodil” locomotives were built between 1919 and 1927. The original full-production run produced 33 class Ce 6/8 II and 18 class Ce 6/8 III locomotives, making a total of 51 locomotives. These locomotives, with their articulated “noses” and many axles, had incredible pulling power and hauled heavy goods trains, commonly including coal cars, on the steep tracks of the Gotthardbahn originating in Lucerne. This route also went through the famous Gotthard Tunnel in the middle of the Swiss Alps. Some of the earliest models with semblance to the Marklin crocodiles were actually so-called “alligator” locomotives. 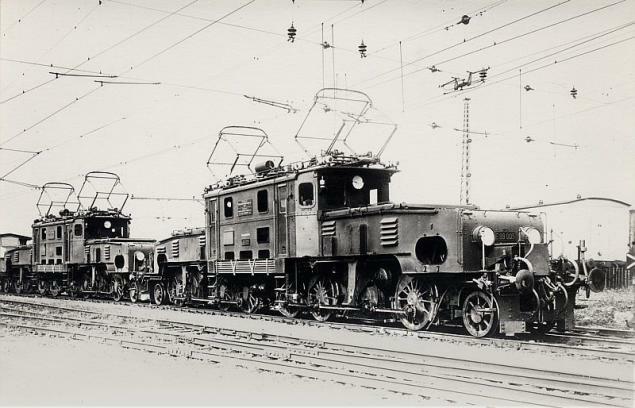 These locomotives were first produced in the early 1920s. In HO scale this kind of design would be shown in the SE 800 or SET 800 locomotives. The SE 800 or SET 800 locomotives are not meant to be a “mini” crocodile. Instead, these are made after the German “E44”-class locomotive. They are also called “Eisenschwein” – “metal-pig”, or “rail-pig” depending on the translation. In the 1934 catalog we can see the Gauge 1 crocodile numbered CCS 66 12921. This locomotive is highly sought after and fetches incredible prices at auction. Since such toys were relatively expensive and only within reach for wealthy families, some collectors surmise that less than a few hundred examples were original sold around the world. What makes this locomotive easily recognizable from its smaller cousin the O Gauge CCS 66 12920 locomotive is the dual-motor design. Each articulated leg of the locomotive has its own motor that powers the two main drive axles. Since there are two motors in this locomotive, each opposite side of the locomotive has visible brush covers. This makes servicing of the motor and brushes very easy as they are accessible without having to remove the articulated section bodies. Although Marklin survived the War, its plans for a CCS model in HO scale were significantly delayed. Its pre-war plans for an HO crocodile were not realized until its release of the CCS 800 in 1947. The first prototype of this model carried the number CCS 700 from the pre-war years. Only one example is known which remains today in the Marklin museum in Goppingen. Based on the black claw couplers this locomotive likely dates from 1936 or 1937. Although the pantographs pose a slight discrepancy as they are not the version from the RS 700, but rather appear to be from the RS 800 model which was first conceived in 1938. The first HO Scale CCS 700 prototype later realized as the CCS 800 in 1947. Marklin produced Version 1 of the CCS 800 in 1947. This first version is distinct from later variants .2 and .3 because of its Schlitz Schrauben or slotted screws that secure the side linkages to the wheels. Later versions .2 and .3 produced in the following years had hexagonal screws. There is also a slight color difference between the first version and the next few subsequent versions. In the year 1949 the model CCS 800 was reinvented in a new design with engineering elements more similar to the other “Super Model” introduced in the late 1940s. In the first few years the only change to the new model was the addition of the sandboxes with grooves and a different lamp holder design. The earliest version of the 3015/CCS 800 even feature some of the same parts as the earlier CCS 800. Such parts include the trailer trucks which were often badly affected by zincpest. Variations on the design were often so subtle that some collectors revert to weighing the locomotive to determine the exact version! The CCS 800 and later 3015 (re-numbered in 1957) locomotives underwent subtle changes over the years up to 1958. Special versions of the Swiss crocodile were produced in a snow-white color scheme for the American market of the railway New York Central Lines. Only one or two examples still exist of the CCS 66 12920 in white. One is in a museum in Belgium of a famous collector who has the locomotive displayed in a private museum display. American distributor Richard Marklin ordered this locomotive specially for the American market. Several manufacturers including Emil Valker of Santhion in Hungary produce a replica of this locomotive in O Gauge. There are no known Gauge 1 variants of this white-painted crocodile but manufacturers have produced this locomotive as a dream-creation as well. 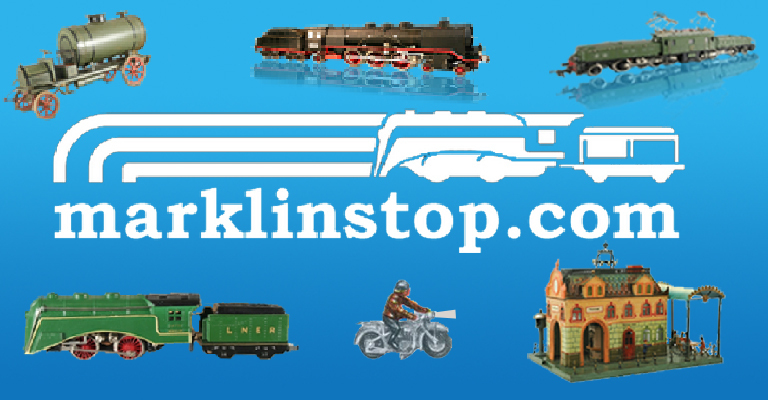 For its 50th anniversary of producing the legendary crocodile, Marklin made the models 30159 and 36159 in 1996. These locomotives were in brown livery and the other in the same construction as the original 3015. Later in 2009, to celebrate the 150th anniversary of the founding of the Marklin firm, they produced two models faithful to the original one. These locomotives came as part of the boxed set 31859. One locomotive in this set was in white livery for the New York Central Lines. 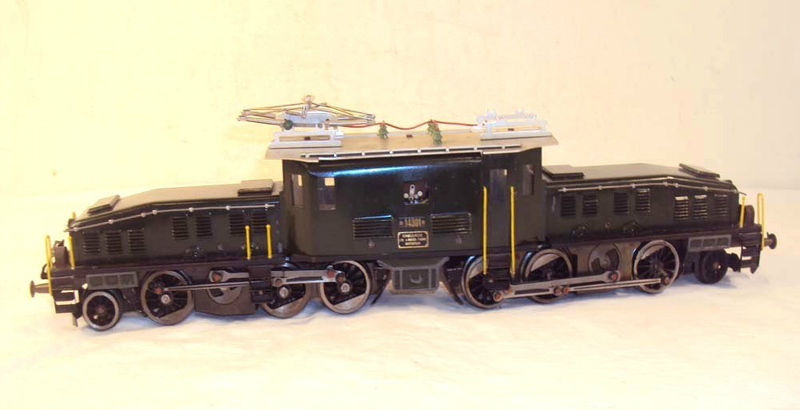 This locomotive carries semblance to the special-order locomotive in O Gauge mentioned earlier. 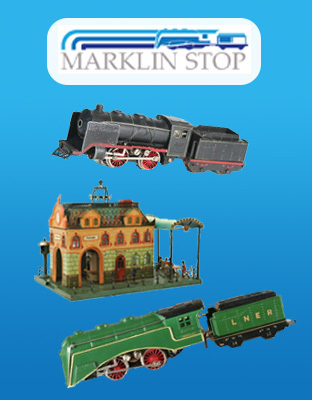 Marklin formed its business in 1859 and as a tribute to this, they made the set in a limited edition of just 1859 units. In the summer of 2009, Marklin presented the same set with different numbers, under set number 31860. Marklin limited the production of this set to just 500 units. With the introduction of Z scale in the 1980s, Marklin of course had to produce a mini-sized crocodile. Despite the challenges of building a difficult and intricate articulated design on such a small platform, Marklin achieved its goal. The Swiss Era II 91mm number 88563 of prototype Ce 6/8 III became the pinnacle of Marklin’s engineering effort in Z scale. 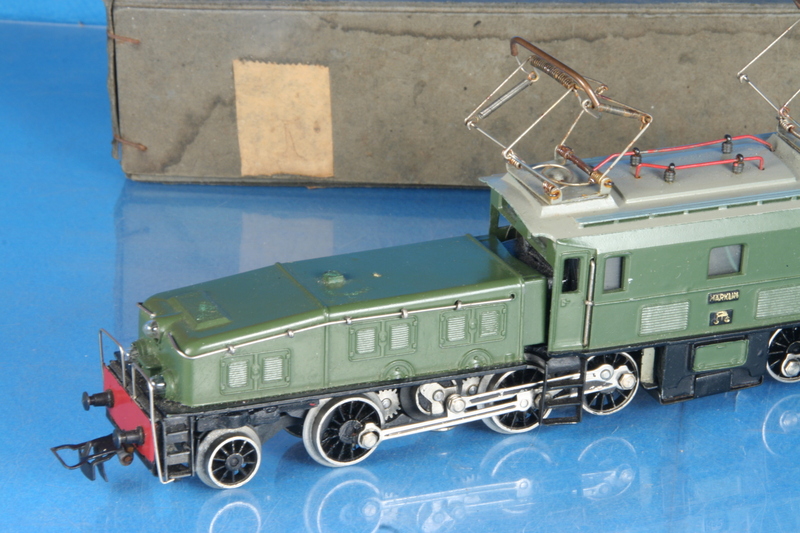 Well-known producers Selzer and HEHR also produce Marklin crocodiles in O Gauge. The manufacturers Thul, Twerenbold, Langefeld, and Santhion of Hungary are also known to produce high-quality reproduction crocodiles. A controversial topic with regard to Marklin crocodile reproductions is the use of the Marklin bicycle insignia on hood of the articulated “legs” of the crocodiles. Most manufacturers leave out this insignia to avoid any potential confusion or copyright infringement. However, some manufacturers include the insignia or add the insignia after normal production. Another such notable manufacturer with roots in Switzerland where these locomotives were original produced is Elektro Keiser (Alois Keiser). The A3/5 Nr. 700-811 Crocodile was produced in O Gauge possibly in the 1940s or 1950s. The massive, highly-detailed engine measures approx. 18-inches in length. While many collectors like their replicas exactly like the original, this presents potential problems with fakes and forgeries. When collectors cannot easily differentiate a reproduction from an original there is potential for disappointment. MARKLIN 37521, NIB, DIGITAL HO, De 6/6 ELECTRIC LOCOMOTIVE "SEETAL CROCODILE"
Glad you enjoyed it! And thank you for producing that wonderful Biaggi video! I was hoping you might have a stab at identifying all the versions after v3. I appreciate that you talk about the sandbox but as far as I’m aware that’s only in v.4 and then again on the 3015 from 1955(?). Dear Paul, thank you for another nice Märklin-article and for letting me read all this! Just one minor remark from my side – the SE 800 or SET 800 locomotives are not meant to be a cheap crocodile – these are made after the German “E44”-class, these are pretty much scale models. They are also called “Eisenschwein” – “metal-pig”, or maybe “rail-pig”. Thank you, Stephan. I’ve updated the article to include information about the class E44 locomotive design. A great story about the greatest of Marklin locs! Thank you very much. In 1976 Markin re-introduced the Crocodile, but with a plastic upper structure and a grey (instead of black) underframe! This caused so much anger in the world of crocodile-lovers and the model did not sell well. The firm decided to accept the return of this model and to discontinue this plastic version with grey underframe and all grey metal frames were destroyed……The trash bin was later raided and the grey underframes re-glued. If one finds any of these crocodiles it usually has a glued grey underframe. Interesting history, very informative. I like your inclusion of other model makers; I would have included Keiser-Zug in that list–their crocodiles are all metal, coarse scale, very comparable to those of Marklin and were actually built in Switzerland. Thanks, Scott. I just added a paragraph and photograph to represent the models of Alois Keiser. They certainly are wonderful models similar to Marklin! Good article. May I suggest that the 0 gauge version of the crocodile CCS 66/12920 was also equipped with two independent motors. I do not have one in my collection but this is how it is described in the period catalogue.